American aid worker, Ebola: Sierra Leone infection reported. 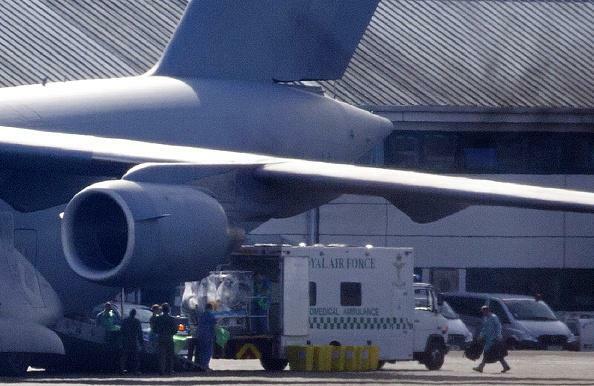 The British patient is transferred into an ambulance at an air force base in London. An American volunteering in Sierra Leone for the aid group Partners in Health and a British military worker in the same country have contracted Ebola. The British citizen, a woman, has been evacuated to a hospital in London, and the American—the first U.S. resident to contract the disease since New York doctor Craig Spencer—has been taken to an National Institutes of Health facility in Bethesda, Maryland. Dallas nurse Nina Pham was treated successfully at the same facility. Per the World Health Organization’s latest Ebola report, Liberia has gone two weeks without diagnosing a new case of the disease. Guinea and Sierra Leone each reported 58 new cases in the most recent week of reporting.